Due to the popularity of my recent post Five Life-Enhancing French Habits, I'm serving up three more ideas this week. After what has been a rough year for many of us, I'm personally looking to infuse my life with gentleness, ritual, and pleasure whenever I can. Et toi? Before my life in France, I thought of scarves as uniformly ugly and scratchy things that my mother forced upon me during the winter. This all changed one day shortly after arriving in France. That morning I woke up in my bedroom in Nuits-Saint-Georges with a sore throat and a hoarse voice. Madame Beaupre, my first host mother, wouldn’t let me out the door to catch the school bus to Beaune without wrapping up my beleaguered throat in one of her many 100% silk Hermès scarves. At first, I bore the scarf like I always had - with a definite air of martyrdom. Us hearty Canucks brooked no molly-coddling. By the time the bus arrived in front of my school, however, I noticed the silk felt nice against my skin. As I was getting off the bus in Beaune I caught a glimpse of myself in the driver’s rear view mirror. I looked chic, I looked elegante, I looked French. The sore throat did not turn into a cold. I had found a new miracle remedy; it was called Hermès. My love affair with scarves continues to this day. At any given time my closet contains about fifteen of them. None are Hermés, but all of them keep my neck warm, add a certain je ne sais quoi to any outfit, and provide me with comfort and pleasure. As for you men out there, I must confess that I have a bit of a thing for men in scarves. Although some men, like my gynaecologist who I nicknamed Docteur Le Foulard in My Grape Village, favor the traditional men’s silk scarf, I prefer a heavier scarf tied simply. If any men out there are under the misconception that scarves are not masculine, please take a gander at Robert Doisneau’s celebrated photo below. I rest my case. 7) Nourish Your "Grain de Folie"
One common thread amongst all my closest friends is that they all carry a grain de folie somewhere in their personalities. A grain de folie means a bit of craziness, a tad of unreasonableness, and a certain capacity to suspend logic at unpredictable junctures. On the surface, my friends often seem like incredibly sensible people. From time to time though, they strike out and do things such as move to London, start a jewelry-design business, consult with past-life spiritual advisors, design amazing city-wide food events, ditch the world and take off to Europe with only a backpack, become a tennis champion in middle age , etc. etc. I could literally go on for hours. They are a constant source of inspiration and entertainment. The french have great respect for people with a grain de folie. My french friend Charlotte always says she's never that interested in people who don't have this quirk. This perhaps explains why when Franck and I embarked on crazy endeavours such as renovating our restored winemaker's cottage we were - oui, bien sûr, met with disbelief, but also a certain grudging respect. When I told people I was writing my first book My Grape Escape my french family and friends were fanatically enthusiastic. None of them wondered out loud if writing a book was a viable way to be spending my time, or if I thought a person could actually make money writing books (incidentally, yes one can, although the honest answer was that I had no idea way of knowing that before actually publishing it). The fact that my project was crazy was enough to satisfy them. Crazy is marvellous. Crazy is anarchy (the French always love some quality anarchy). Crazy is LIVING. Consider nourishing your own grain de folie and applauding it in the people around you. If nothing else, it makes life way more intriguing. One of my favorite parts of a traditional french meal, whether it be lunch or dinner, is the apéritif. This initial ritual sets the stage for the hours to come and puts people in the correct frame of mind to socialize. It also, the French believe, "opens the appetite" for the deliciousness to come. Similar to the beloved coffee break, the apéritif signals that it is time to slow down and just wallow in pleasure for the next few hours. The french tend to be extremely proficient at ritualizing these "gear shifting" moments. I try to integrate them into my daily life whenever I can. Step #1: Pour the cassis and then the aligoté into a short wine glass (NEVER pour in the wine first, then add the cassis, or for the-love-of-God ever attempt to stir it at any point). 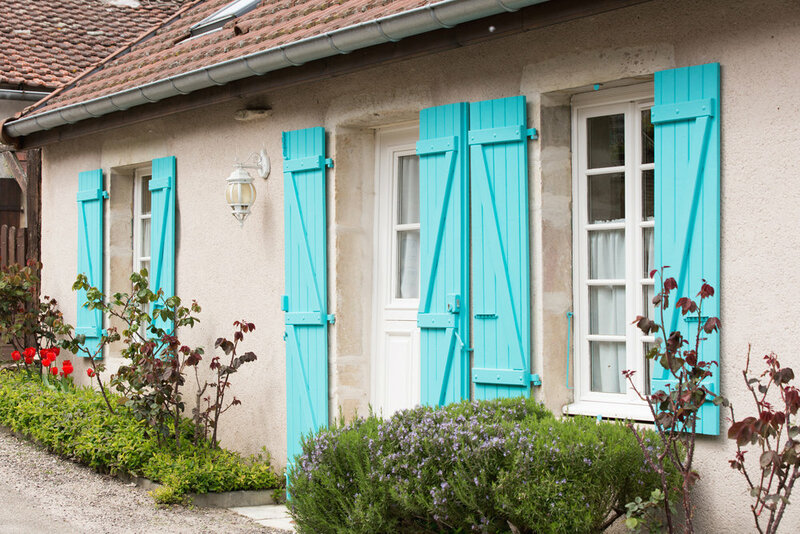 Interested in learning more about life in France? Check out my bestselling Grape Series of books.